A couple years ago my mom asked me if I wanted to sign up for a random “Focus Group” (don’t ask me the name, I couldn’t even tell you..). She belonged to it for years, they call every so often, ask you a series of questions, and if you qualify it’s about a couple of hours of your time for $100 an hour (pretty sweet, eh?). Well, I got a call in the summer about make-up. They put a lot of emphasis on mascara, so obviously I knew it was about mascara. The thing is, they ask you questions, but don’t actually tell you what would happen if you were picked. I always had a small container for my make-up, and I would continue to buy it… see, I’m a sucker for the SA. If they show me something “what if you mixed this blue with this silver” I would gasp and say WRAP IT UP. Slowly, my containers would get bigger and bigger.. until finally I had to head on over to wal-mart and purchase a 7 drawer case (you know the ones they suggest for towels!). One drawer for eye shadow, one for eyeliner, one for brushes etc. We were shown various ads, catch lines, TV ads etc. A total of 2 hours and $200! In the end, they each gave us a Cover Girl Lash Blast – we were to try it out for a couple of days and they would call us. I was actually heading up to my cottage for a week, and they were expecting me to try out the mascara within the next two days. It was Monday morning, and I had until Wednesday to try it out. But who wears makeup at the cottage? Well, I was hesitant. I’m used to Dior, Stila, Lancome, etc. Well bright and early Tuesday morning I gave it a shot. There is nothing else to say other than WOW. It goes on smooth, and gives an excellent distribution of mascara, and it actually worked. I honestly couldn’t believe it. It actually gave my lashes volume. But how? How can something that cost $10 be better than something that is $35? Cover Girl beats out Dior? Unthinkable (at least what most would think). Well, let’s just say, the only mascara I have been using is in fact Cover Girl Lash Blast. And to think of all those $35 tubes of mascara I bought. #1 – Use an eyelash curler before applying mascara. Or, if you prefer to curl after application, make sure that the mascara is dry. #2 – Try a lash primer. These are designed to coat the lashes so that the mascara will really make your eyes pop (I never seem to remember to use primers, but I have friends who swear by it). Resist the temptation to pump the wand in and out of the tube of mascara. I don’t know why we do this, but it introduces contaminants to the tube and also causes it to dry out faster. #3 – Proper application is starting with the wand at the base of your lashes and working out to the tips. #4 – Wiggling the wand at the base of the lashes is said to make your lashes look thicker. #5 – Wiggling the wand as you coat the lashes from base to tip will help keep the lashes from clumping together. #7 – If #6 didn’t work so well for you, use a lash comb to get rid of any globs of mascara. Use the lash comb to separate any lashes that are stuck together. #8 – Don’t want to buy a lash comb? Try creating your own with an old mascara wand: Clean thoroughly with make up remover and let dry. Then continue to clean as you would your other makeup brushes and applicators. #9 – Black mascara works for nearly everyone, but if you think it’s too harsh try brown/black. Want to try some coloured mascara? Avoid a garish look by applying one coat of black, let dry, and then a coat of color. #11 – Keep eyes open really wide (unnaturally so) for a few moments before blinking. This will help make sure the mascara is at least partially dry, and can help reduce smudges around your eye. #12 – To help reduce under eye smudges, powder the under-eye area before application. #13 – If you still get a smudge, remove carefully with a Q-tip: Press the Q-tip onto the smudge with a bit of pressure, then rotate a half-turn. This will remove most smudges quickly and cleanly. Find a wand/applicator that is easy for you to use, and that delivers the look you want. There are applicators shaped like combs, and brushes of varying sizes, shapes, and configurations. You can find applicators with straight wands and with a bend at the end. A bent wand can help provide a little steadier hand, if needed. 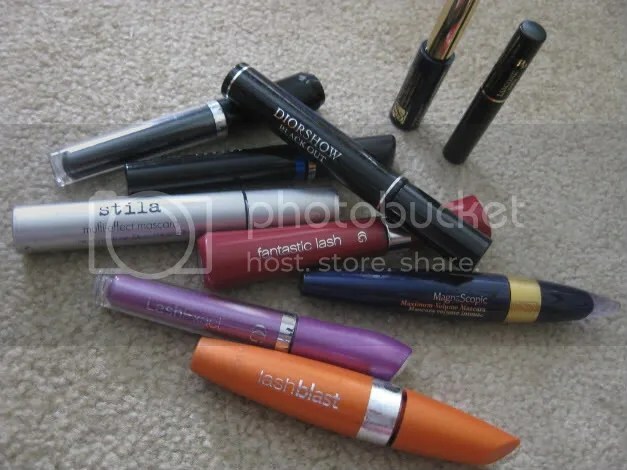 #16 – Although you may have a favorite mascara, don’t be afraid to experiment. A new color or new applicator brush may give you a totally amazing look.